There was a glitch with the Yearly Plan start date due to a timezone issue. It was resetting the start date forward on day. Due to a timezone issue, the yearly plans Start Date was being reset each time the Yearly Plan was opened. This has been resolved. Users could not duplicate publically available plans and modify them.This has now been resolved and the duplicate button is appearing on Yearly Plans set as "Publically Available" (as shown in the image below). 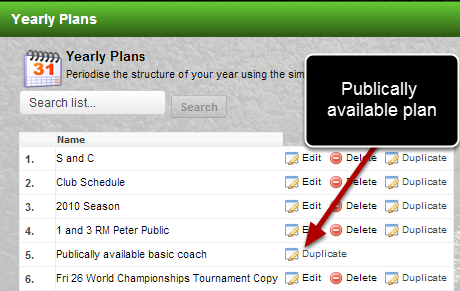 Plans can now be duplicated, updated and applied to the appropriate athletes.